I don't even remember when I firast walked into a Starbucks. It was years ago. Probably in Dallas, Manhattan (above: SoHo), or Seattle's Pike Place Market, the location of the very first Starbucks. I like the consistency of the drinks, the feeling of community among fellow coffee addicts, and the ambiance and interiors of the stores. I often take my laptop and get work done (I'm typing this now while sitting inside a Starbucks). I enjoy the conversation, the music, watching the people, and the notion of writing and hanging out in a coffee shop - like the Cafe Society in Paris in the early 1900s. Market/sell coffee and a variety of hot and cold drinks. Provide a clean coffee drinking environment. Stay current with music, technology, and seasonal specialties. Serve pastries and food that are usually very good. Very few of the stores I've been in can get the interior layout right. The fixins counters are in awkward places, there are often too many retail islands of merchandise in inconvenient places, and there are not enough tables and chairs. Lots of stuff is wasted at a Starbucks. I have witnessed numerous people walk from the pickup counter to the trash and throw away the lid. They put a lid on every drink. Even when I order an iced coffee. Once in Oklahoma, as the barista was about to put a lid on my coffee, I said "I don't need a lid". She stated that she had to put a lid on it. I mentioned it was an iced drink. She tried to convince me that the coffee was very hot when she put it in the cup, therefore a lid. I pointed out that there was now ice floating in the cup - that coffee had apparently cooled off quite a bit and I was only transporting that cup of coffee about 4 feet to a table. She was insistent - that cup had to have a lid on it. This also happened in Manhattan when I ordered an Iced Coffee. 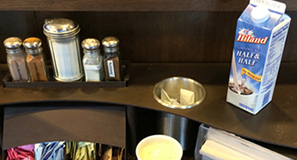 This barista argued that he couldn't let a drink leave the counter without a lid. I asked him if he really thought I might hurt myself on an ice cube. He indignantly took off the lid and threw it in the trash. That lid provided no value to the company, the consumer, or society; and it defied any thought of "Environmental Stewardship". Now a lid on a coffee that is to go makes sense. Let me explain why a lid on every drink is ridiculous. 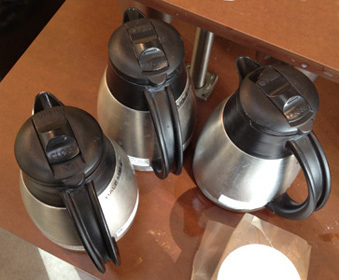 For coffee consumed in the store, the lifespan of the lid is about 4 seconds. It lives its entire useful life from being put on the coffee until I take it off at the fixins counter. But look what that lid has gone through: raw materials shipped to a manufacturing plant, the manufacturing process, transportation to a storage facility, storage in a warehouse, shipped to individual Starbucks locations, checked in and stored in the retail store, set out in columns at the coffee prep area. Then it lives its entire 4 second life. Then removed and put in the trash, bagged up and set out for pickup, pickup by the local community garbage collectors, and, finally, shipped to a landfill where it languishes for decades. It doesn't seem worth the effort, expense, materials, personnel, and hassle for such a short useful life. 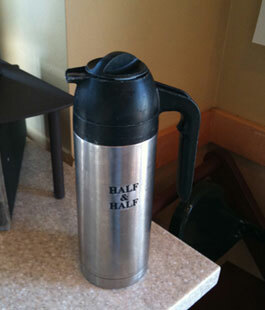 In a sense, it never had a useful life - there was never any need for me to have my coffee covered while I walk 4-8 feet. I am amazed at how many perfectly good lids I see inside every trash can in every Starbucks I've been in. The solution is simple - have the baristas ask: "Would you like a lid on that?" This could happen at the register and a code marked on the cup or it could happen at the pickup counter as the barista reaches for a lid. 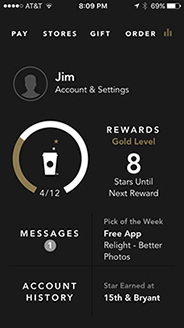 While it is an additional task for the barista (although offset by deleting the lidding task on many drinks), it leaves the decision and responsibility up to the customer, where it ought to be. And it will save materials, minimize the amount of trash, and keep more plastic out of landfills. Note: To minimize the waste from unnecessary lids, double cups, and sleeves, I now simply take my own mug with me. Problem solved. After finishing my coffee, I rinse out the cup in the restroom and place it back in my car or backpack - ready for the next visit. Also, when I get coffee at a place where the urns are out for the customer (like at coffee bars, Borders & Noble, convenience stores, and Panera) I put the sweetener and cream in an empty cup and then add the coffee. The coffee swirling into the cup mixes the sweetener and cream so there is no need to use (and waste) a stir stick. The great creamer battle between the two Women with Flowing Hair. Which is the better cream container? On the left is an intuitive stopper on the cream canister - the handle jutting out says 'press me'. On the right, the screw cap might say 'turn me' but how far? Is it already open? If I turn it will the cap come off and spill the contents? Which way do I turn it? Okay, that is just too many questions. And I probly shouldn't ask them out loud while standing at the fixins stand. One can operate the one on the left with one hand while the one on the right requires two - one to hold the canister and the other to turn the cap. Also notice the labels on the canisters. One is designed to enhance the graphics and decor of the restaurant, the other looks like tape from a labelmaker. 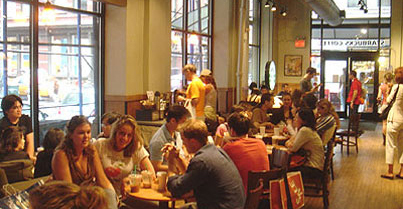 Photos were shot at Panera and Starbucks in 2011. 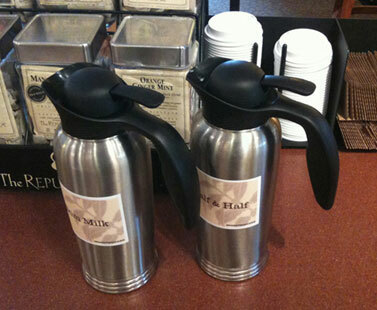 Some Barnes & Noble Starbucks in New York City are using these creamers with the handle and lever - much better. 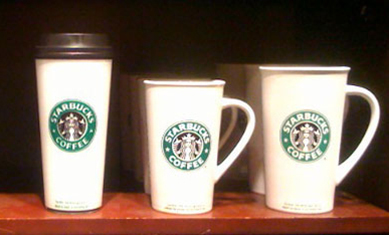 Now, Starbucks needs to invest in some custom-made vinyl stickers that convey the contents and fit the new design motif of their stores. Above right: another way to solve the problem. Whole Foods is typically lauded for thoughtful attention to detail. But what is this about? Do you close the open slot to open it? Open the close? Tip: A customer should be able to glance at a creamer and easily understand how to open and pour the contents and which type of cream/milk it is. Nice idea - but poor execution - the labels show up only when the creamer is facing a certain way. Solution? So simple, its a bit frustrating - print the label on the band 2 or 3 times, all the way around the band. 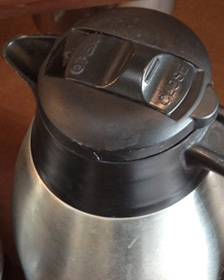 Then, no matter how the creamer is set back on the counter, the label will be visible. As with most poor design decisions, the designer or producer didn't imagine the product in use. If there had been more observation or testing, they would likely have noticed that the creamer was set down in a variety of positions. Design a simpler app - see details above. Design, build, and install new 'Fixins counters' that are dual use - that is, that two people can access the condiments at the same time without intruding on each other. Most fixins counters are single use only. The layout can be more efficient with compartments for the items so that the new two-person unit would not take up much more space than the one-person unit. Label the creamers in a more user-friendly way. Offer, but don't require, a lid on every cup (see above). Recycle more. Lots of trash in the cans is recyclable - napkins, paper bags, and newspapers. 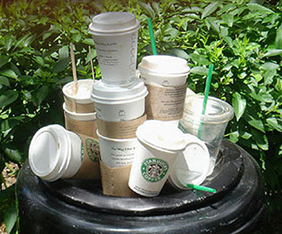 Starbucks could put into practice what they preach on their website about 'Social Responsibility' by providing recycle bins. Design receptacles with compartments: paper, bottles, trash. Reorganize the retail displays. Some Starbucks feel like stores rather than coffee houses. There's a maze of baskets, racks, shelves of CDs, mugs, coffeemakers, etc. to wade through just to get a cup of coffee. Sure, the displays in the way increase impulse sales, but they detract from the experience a bit too much. Group much of the retail into a section for those that are shopping (leave some for impulse purchases). More tables and chairs. While it may crowd some of the stores, most stores have the room and the need to accommodate more people. Especially now that some stores provide free wireless services. Commission new tables that are squound and have a larger work surface. Encourage reusable ceramic cups. Sell cups more cheaply than in stores. See them as a community service, not a profit center. 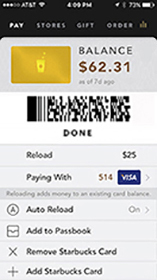 July 15 2016: We always want to hear what you think would improve your experience with Starbucks. I appreciate you letting me know how much customers would enjoy this. Please accept my assurances that your comments are valuable to us and have been shared with the appropriate team. If you ever have any questions or concerns in the future, please visit us at CustomerService.Starbucks.com. March 21 2017: Thank you for contacting Starbucks Coffee Company. I hope that this email finds you well. We sincerely appreciate your desire to present your suggestions on how to improvement (sic) our app. Unfortunately, at this time we do not accept unsolicited business ideas or proposals and we are unable to respond to requests to link to third party Web sites. If you ever have any questions or concerns in the future, please visit us at CustomerService.Starbucks.com. 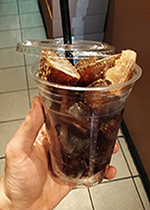 • Frozen coffee cubes in iced coffee so it doesn't get watered down. • Fettuccine stirrers, reducing environmental impact (it doesn't make coffee taste like pasta). 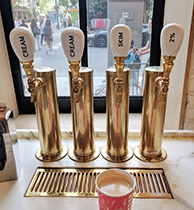 • Creamer on tap, keeping it cold and fresh for customers. 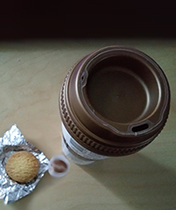 • Special lid indents for holding a cookie, keeping it warm.